Climbed my first 8000m plus without bottled oxygen or sherpa support. Wanted to try 8000m plus and it went fine only some smal frostbite on my toes that did go away after a while. Overall great experience climbing new levels of altitude in the Himalayas but pricey. I walked in to basecamp Moskvina in the Pamirs this season again but solo this time and we managed to summit the highest peak in Central Asia and in the former soviet, Peak Kommunizma 7495m. I have now climbed three 7000m peaks in former Soviet. There are still two more to do, hopefully next season. Felt the urge to do something on the bicycle again and took advantage of the simplified visa rules during Fifa world cup to visit the country I was born. Total distance made: Göteborg-Nizhny Novgorod 2500km. Also a good preseason training for the big mountains. Dubble 7000m plus summits in Central Asia 2017. As I develop in the high altitude climbing game my peaks get higher and higher. First we did a try on Peak Lenin (7134m) together with Noah Sandgren only 16 years old. It was his first experience and under my guidance he reached 6200m! I reached the summit on the 19 of July and became the forth person for the season to reach the summit. Later I teamed up with Adventure of year price winner in Sweden 2017, Douglas Asplund. He by the way completed his project, read more about that in the link above. We climbed the Peak Korhzenevskaya (7105m) in the Pamirs. We also did the walk in to the mountains, that took us on one week journey of hard trekking, glacier crossings and passes to make to Moskvina bc. We finally understood why no porters wanted anything less then 3,5 monthly salarys to help us carry in our gear. Its tough, really tough, and dangerous. We started off without support and carried 29kg and 27kg from the start into the bc. It was a good warmup for Korhzenevskaya. Unfortunately Douglas cancelled his summit attempt because of safety concerns and continued solo to reach the roof of the Pamirs once again this summer. I ended off the season with some trekking and easier alpinism in Karakol mountain range to explore one of the most scenic mountain areas of Kyrgyzstan. I had some time off this summer and decided to explore Norway some more. Norway has so many beautiful places and spectacular locations its ridiculous. Specially trad climbing on Lofoten and Kvalöya area, are some really strong memories from this summer. But pretty much the whole country is amazing for nature experiences and we got to climb Norways national mountain the Stetind. I created some videos from this trip find it here. 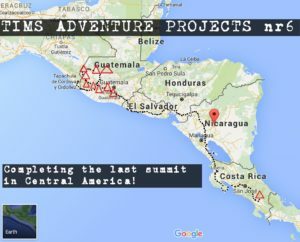 Between march and April this year I have been cycling and collecting the 10 highest summits in Central America. I got to visit 7 new countries and Mexico becoming my country number 50 I visit with a bicycle. The mountains and volcanoes are best visited with trailrunning shoes and done very lightweight for the exception of Acotenango. Acotenango have an active vulcano just next to it and its nice to enjoy that from a tent camping only 2,5 kilometers from the active one seeing constant eruptions. This tour I ended with a visit to Cuba Island, I had to go before because that country is going to change alot the coming years. I did some adventure project videos about collecting the highest summits in Central America, find it here. There is also a 5 min short summary video here. In January 2016 I went back to Argentina to finish what I have started. After successfully climbing the Huascarans summits last summer in Peru. I had now four more to climb to complete this project. This I did during january and february months when I had good conditions in Argentina. I also did summit number 12 Incahuasi beacuse some people are considering the twin summit of the Huascaran mountain as one summit and similar ideas are being discussed about the Tres Cruses peaks. Its been a great project and challenge to do with the crux being climbing the Huascaran peaks because of collapsing glaciers and avalanches on route to camp 2 (Garganta). This is a seriously dangerous mountain that takes lifes every year, speed was important and passing the most dangerous parts during night. All the summits collected in this video. A combined long-distance bike ride with ascents of South America’s highest mountains along the way. The route went through Chile, Argentina, Bolivia, Peru and Ecuador. Andes offered stunning views, biking, camping and many lovely peaks to climb. 8000km by bike and 11 climbs. For completing this tour I got the award, Adventurer of the year in Sweden 2013. Blog in Swedish can be found here. A challenging route with some of the world’s highest passes and magnificent scenery. I passed six countries, and after 13.000km I ended the tour in Kathmandu, Nepal. The route offered major elements of the Buddhist culture, lots of passes over 4000m and the views of some of the highest mountains on earth. Countries visited on this tour: Thailand, Laos, China, Pakistan, India, Nepal. My longest trip to date through 24 countries. I had the company of Nino Jönsson and Erik Törnblom down to Africa, then went solo through the Arabian Peninsula and Central Asia all the way to China. Old blog in swedish can be found here. In 19 days, Me and Aron Gilljam cycled down to Chamonix from home to do what Göran Kropp did but smaller in size. We rode to the foot of a mountain and climbed it. We summited Mount Blanc on this tour.